Russian preacher, known as the "Kelmer maggid"; born in Slonim, government of Grodno, 1828; died in Lida, government of Wilna, Nov. 9, 1899. At the age of ten he lost his father, and he was brought up by his maternal grandfather, Eliezer Brisker, who was a good rabbinical scholar. Young Moses Isaac was diligent in his studies, and at the age of fifteen made his first attempt at preaching in one of the batte midrashot of his native town. He continued studying rabbinical literature, even after his marriage at the age of eighteen. Three years later he became a pupil of R. Israel Lipkin, who recognized his talent for preaching and encouraged him to make it his profession. Moses' biographers do not agree as to the dates and places of his preacherships. 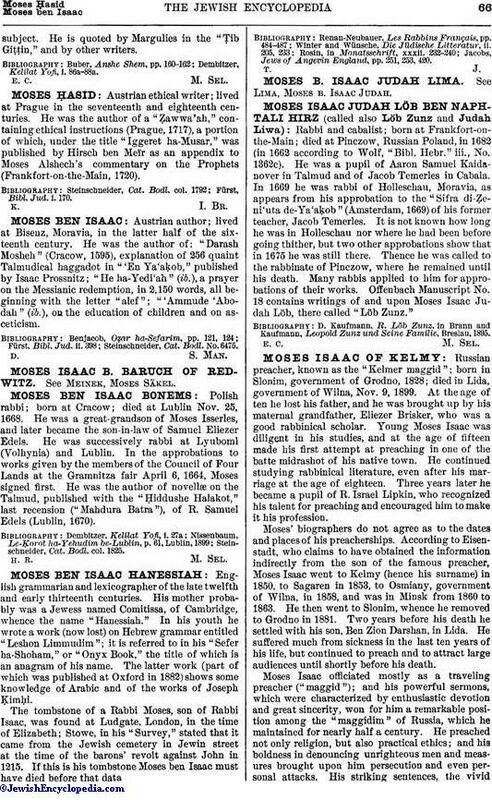 According to Eisenstadt, who claims to have obtained the information indirectly from the son of the famous preacher, Moses Isaac went to Kelmy (hence his surname) in 1850, to Sagaren in 1853, to Osmiany, government of Wilna, in 1858, and was in Minsk from 1860 to 1863. He then went to Slonim, whence he removed to Grodno in 1881. Two years before his death he settled with his son, Ben Zion Darshan, in Lida. He suffered much from sickness in the last ten years of his life, but continued to preach and to attract large audiences until shortly before his death. Moses Isaac officiated mostly as a traveling preacher ("maggid"); and his powerful sermons, which were characterized by enthusiastic devotion and great sincerity, won for him a remarkable position among the "maggidim" of Russia, which he maintained for nearly half a century. He preached not only religion, but also practical ethics; and his boldness in denouncing unrighteous men and measures brought upon him persecution and even personal attacks. His striking sentences, the vividimagery of his exhortations, and the singular parables with which his discourses were illustrated, added to the peculiar sing-song in which his sermons were delivered, gave rise to much ridicule, but also tended to increase his popularity. His arrival in a city was always an important event among the religious members of the community. He was instrumental in founding societies for religious, charitable, and communal purposes, his preaching preparing his audiences for such institutions; and, generally, he exerted an influence far beyond that of any other strictly Orthodox maggid of his time. 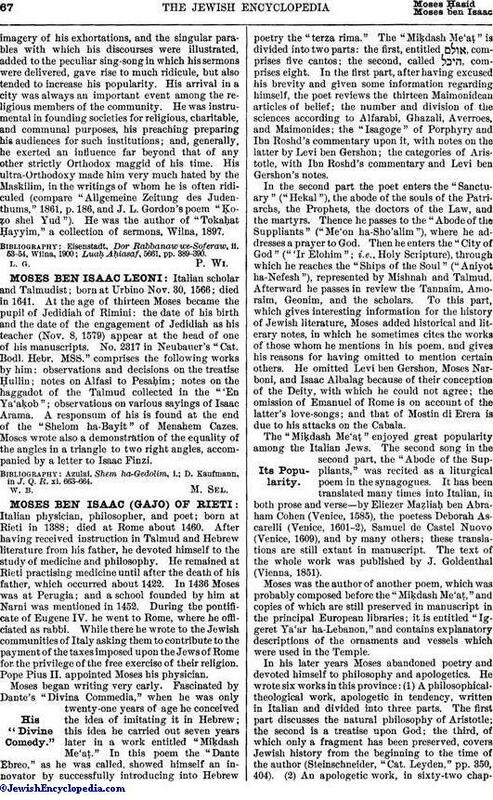 His ultra-Orthodoxy made him very much hated by the Maskilim, in the writings of whom he is often ridiculed (compare "Allgemeine Zeitung des Judenthums," 1861, p. 186, and J. L. Gordon's poem "Ḳoẓo shel Yud"). He was the author of "Tokaḥat Ḥayyim," a collection of sermons, Wilna, 1897. Luaḥ Aḥiasaf, 5661, pp. 389-390.